The Defense Minister of Poland became a YouTube star as the man who "can't tell a mic from a lamp." The video went viral, gathering hundreds of thousands of views. 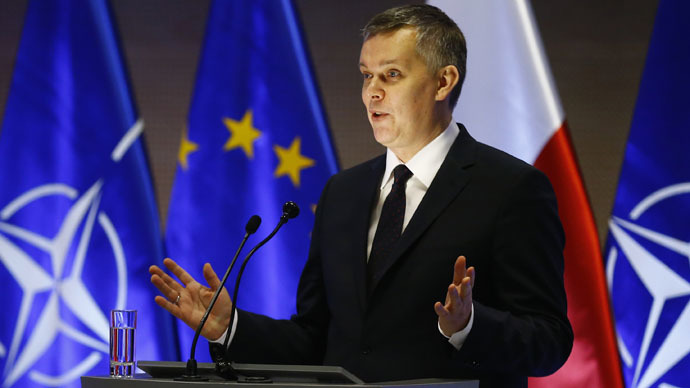 Tomasz Siemoniak, Poland's deputy Prime Minister and Minister of Defense, was addressing the army's top brass and the president at an annual gathering. After confidently strolling to the podium, he adjusted the microphone... and the desk lamp, raising it from the documents in front of him and pointing it up at his face. The minister then continued his speech, unfazed by the bright light shining straight into his eyes: "Today the matters of Polish military security, which have always been acute, are in the center of the Poles' attention," he said. "We feel the army is being supported by the whole society." The video of his address certainly gained popular support - at least the first 16 seconds of it, where the official is fumbling with the lamp - with hundreds of thousands of views of its various reposts on YouTube. The video poster's comment reads, "This guest will provide security for us all. Sleep easy." The video of the Defense Minister and his three minutes in the spotlight was even posted on the Polish Defense Ministry's channel - but it starts after the moment he raised the lamp. The bright spotlight is clearly visible on his face, however.